The Ride the Train and Relax Day was coordinated by SunRail and Orange County Government in support of Mayor Teresa Jacobs’ sustainability initiative, Our Home for Life. The initiative provides specific, incremental and transformative changes through 2040 toward a more prosperous, healthy and livable community. 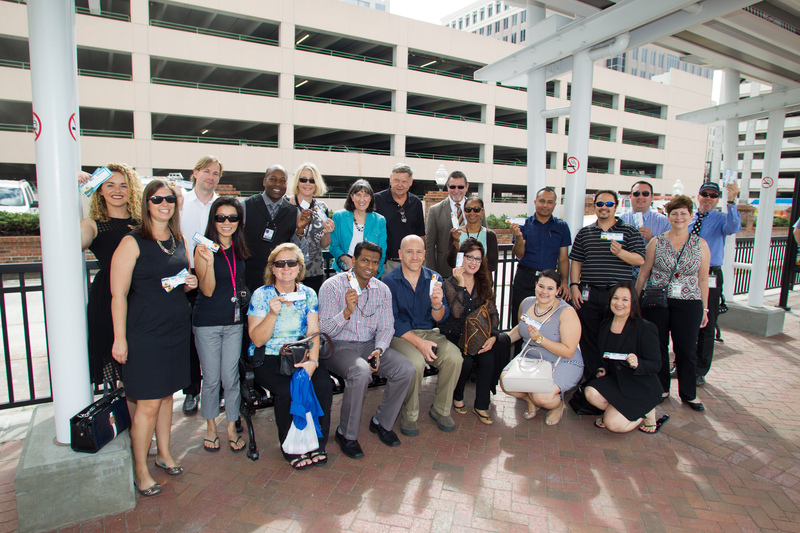 Free tickets were provided to Orange County employees to experience the ease of using SunRail for work, lunch and on their commute back home. Since it began operating its 31.5-mile route from DeBary to Sand Lake Road, SunRail has averaged 4,100 passengers per workday. As construction work begins on the six-year I-4 Ultimate project, SunRail expects even higher ridership as commuters, who want to avoid construction traffic jams, switch to SunRail during peak times. Currently a 61-mile rail line, SunRail is eyeing Phase 2 expansions, which would include stations in Kissimmee and Poinciana, and as far north as DeLand in Volusia County. Orange County District 5 Commissioner Ted Edwards also joined riders at the Winter Park station and arrived at Church Street Station for a short walk to the Orange County Government Administration Center. Commissioner Edwards said using mass transit and SunRail helps decrease emissions and boosts businesses situated around the SunRail stations. Countless Orange County employees have used SunRail and understand the benefits of mass transit. Ivelisse Torres, Financial Advisor, Fiscal and Operational Support for Orange County Community Environmental Development Services, says she rides SunRail for the ease and convenience of not having to worry about driving in traffic and being able to have a stress free commute. “I’m doing two things at once, I’m saving money and getting my workout in by walking to work from the station,” Torres added. Timothy Maslow, Assistant Project Manager, Economic Development and Research Section for the Orange County Planning Division said SunRail allows him to live a more sustainable lifestyle. SunRail’s 61-mile system of existing rail freight tracks scales a four-county area and is funded and supported by the Florida Department of Transportation in cooperation with the federal government and Orange, Seminole, Volusia and Osceola counties with the City of Orlando. Photos from the SunRail Ride Free Day may be found on Flickr for use by the media.